Everyone can shop and SAVE at our Spring and Fall events! See schedule below for event hours and to get your FREE ticket! Keep up with your growing kids! Shop thousands if like new items at dicounted rates! 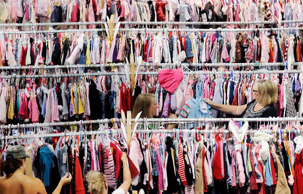 clothing- shoes - toys - baby gear - books - sports equiptment - electronics - maternity - games - strollers - outerwear - costumes - and so much more! 8:00am-10:00am - Grandparents shop early! First 50 Grandparents through the door get a special treat! Located inside Crossroads Center, between Target and Macy's, near the Children's Play Area. "The event was very clean and organized, the prices were excellent and shopping was made very convenient. " Being able to clean out closets and get a reasonable amount of money for the items I sold.